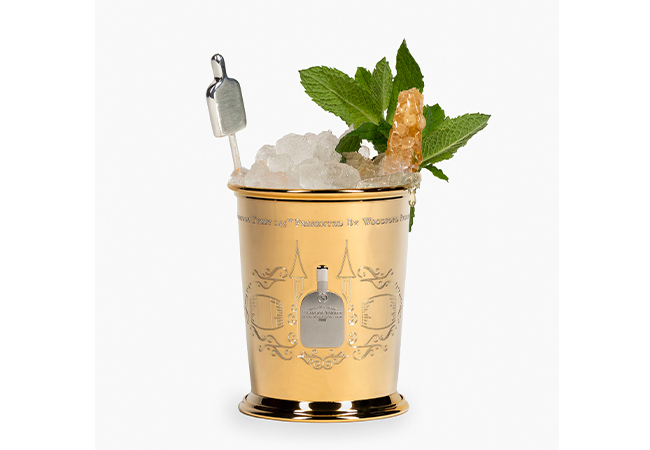 The gold-plated mint julep glass that's $2,500. One of the 125 silver glasses. April 10, 2019 (Louisville, KY) — Woodford Reserve, the Presenting Sponsor of the Kentucky Derby, today revealed its celebrated annual Kentucky Derby tradition — the $1,000 Mint Julep Cup. To truly mark The Best of Kentuckyon Kentucky’s Best Day, this year’s $1,000 Mint Julep recipe includes a unique offering — a Kentucky honey sweetener that has rested inside an oak barrel for 145 days inside the famed Twin Spires at Churchill Downs to commemorate the 145th Kentucky Derby. This year the celebratory program pays tribute to the John Asher Memorial Scholarship Fund at Western Kentucky University. Asher, longtime Vice President of Racing Communications and spokesman of Churchill Downs beloved by many within the equestrian community, died suddenly in August 2018 at age 62. A proud alum of Western Kentucky University, Woodford Reserve is honoring his memory through this year’s $1,000 Mint Julep Program by donating funds to the bright young minds at the college. This year’s julep cup honors his life and dedication to the industry, while celebrating the spirit of the Kentucky Derby just as he would. 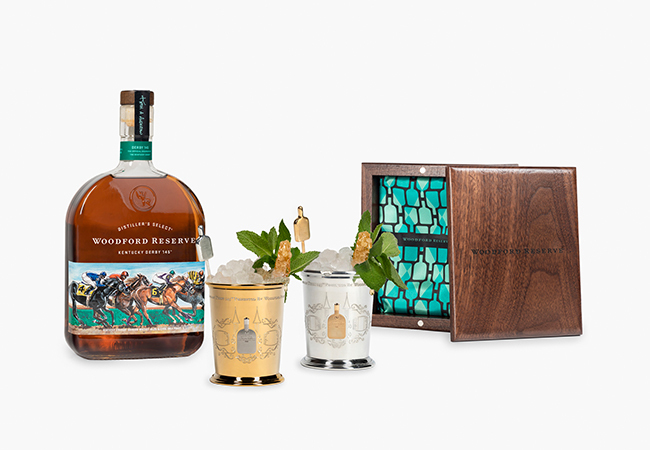 Each $1,000 Mint Julep cup will be presented in a wooden box lined with jockey silks featuring the iconic flask-shaped Woodford Reserve bottle which were designed by Bourbon Cousins of Cincinnati, Ohio. The silver cups are handcrafted by Louisville jeweler From the Vault, and each is adorned with embellishments representative of the Best of Kentucky. Now in its 14th year, the $1,000 Mint Julep program is an annual Derby tradition. This year’s recipe was crafted by Woodford Reserve Master Distiller Chris Morris and Assistant Master Distiller Elizabeth McCall, who climbed into the Twin Spires on a cold December day to place the honey sweetener for the final cocktail recipe to rest for 145 days. For the full “inspired” cocktail recipe for this year’s $1,000 Mint Julep please see the below. There are 145 cups available this year — 125 silver cups and 20 silver cups plated in gold. The silver cups are $1,000 each and the gold-plated cups will be available at the price of $2,500 per cup. Sales of the cup begin at 10 a.m. on April 10 to consumers ages 21 years and upat www.woodfordreservemintjulep.com. The sale closes at noon on April 30, 2019. 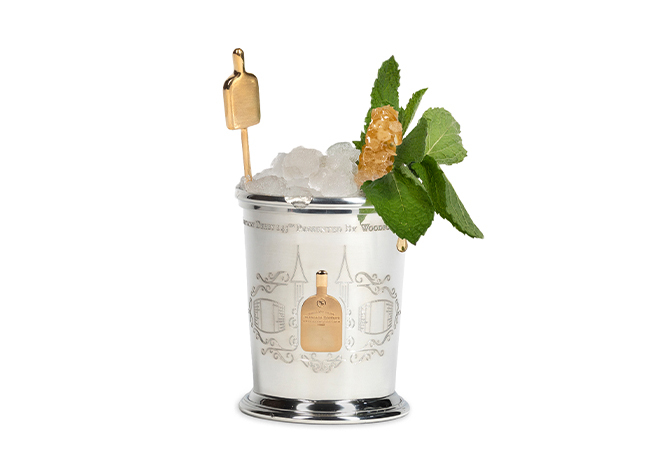 Cup buyers will have access to the Woodford Reserve $1,000 Mint Julep Tent and hospitality area on Derby day, where they will receive their handcrafted mint julep. Any unsold cups will be available for purchase at Churchill Downs on Kentucky Derby Day (May 4th). Purchase of cup does not include admission to Churchill Downs. Purchased cups must be claimed by the buyer or his or her submitted and approved proxy at Churchill Downs on Derby Day between the hours of 9:00 a.m. and 4:00 p.m. For complete terms and conditions, please visit www.woodfordreservemintjulep.com. Churchill Downs, the world’s most legendary racetrack, has conducted Thoroughbred racing and presented America’s greatest race, the Kentucky Derby, continuously since 1875. Located in Louisville, the flagship racetrack of Churchill Downs Incorporated (NASDAQ: CHDN) offers year-round simulcast wagering at the historic track. Churchill Downs will conduct the 145thrunning of the Kentucky Derby on May 4, 2019. The track has hosted the Breeders’ Cup World Championships nine times. For more information visit www.ChurchillDowns.com. Woodford Reserve, the “Official Bourbon of the Kentucky Derby,” is crafted at the historic Woodford Reserve Distillery, tucked in the heart of thoroughbred country in Versailles, Kentucky. A National Historic Landmark, the Woodford Reserve Distillery represents craftsmanship with a balance of historic heritage and modern practices. Woodford Reserve is a product of the Brown-Forman Corporation, a premier producer and marketer of fine quality beverage alcohol brands including Jack Daniel’s, Finlandia, Korbel, Tequila Herradura, Old Forester, Sonoma-Cutrer and Chambord. Please enjoy your bourbon responsibly. To learn more about Woodford Reserve, visit us http://www.woodfordreserve.com/or check us out on Facebook at http://www.facebook.com/woodfordreserve.